Originally published in 1980, The Complete Official MG Midget 1500: 1975-1979 repair manual was prepared in close cooperation with British Leyland Motors in order to provide complete and authentic maintenance and repair information. The Driver's Handbooks, which comprise the first three parts of this manual, are the handbooks that were provided with every new MG Midget 1500. 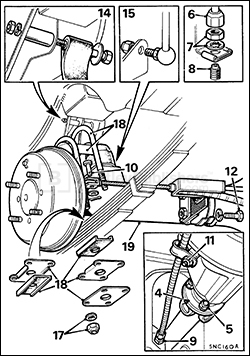 The Workshop Manual, which comprises the fourth-and largest-portion of this manual, is the official factory manual. 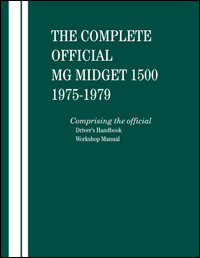 The Complete Official MG Midget 1500: 1975-1979 contains emission control information that applies specifically to MG Midget 1500s manufactured for the US market as well an illustrated catalog of service tools. Including accurate and comprehensive service information for 1975-1979 MG Midget 1500s, The Complete Official MG Midget 1500: 1975-1979 is an indispensable resource for both the professional mechanic and the MG Midget 1500 enthusiast. The publisher has incorporated additional factory procedures and specifications that became available following the publication of the original factory information. 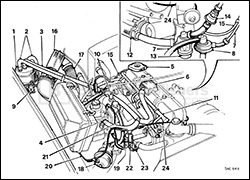 This manual includes detailed technical coverage for engine type PE 94J. 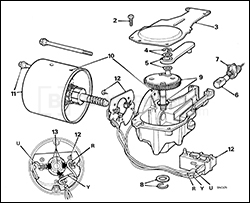 Rear Axle Assembly - 1977 and later U.S.A.